Nature and urban life exist in harmony in Perth, on Australia's west coast. 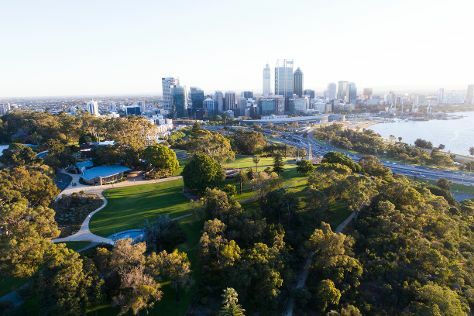 Here, where the locals soak up more sunny days than in any other Australian capital city, you can visit nearby Rottnest Island, walk in leafy Kings Park and tour Swan Valley vineyards. For local culture, wander the nearby city of Fremantle's winding portside streets and Perth city centre's museum and gallery precinct. International flights arrive directly into Perth Airport from many global transit hubs. From the airport it's an easy 35 minute taxi or coach ride to the city centre. Perth is in Greater Perth. Use our Australia attractions planner to plan your trip to Perth and other destinations in Australia.